48 mtpa of 2nd wave US exports are queued to go. But a new business model is required to drive down costs and take projects past FID. 48 mtpa of 2nd wave US export projects are queued to go. They have sites, FERC approval and in many cases good access to infrastructure and skilled labour. Behind this are at least another 50 mtpa of projects currently progressing through the FERC approval process. The problem these projects face is a lack of long term offtakers. Only one 20 year LNG supply agreement has been signed so far in 2017 and it was small (1 mtpa between Edison and Venture Global, developers of the Calcasieu terminal, yet to get FERC approval). Buyers are instead pushing for shorter term contracts with greater flexibility, for example the 2.5 mtpa 3 year offtake contract Petronas signed In October with JERA. LNG is currently a buyer’s market. The pace of comitted new supply is for the moment outstripping expected demand growth and is likely to continue to do so until at least 2020-21. This is driving liquefaction project developers to adapt and innovate in order to build a robust business model to underpin investment in the next wave of export capacity. Table 1 summarises five key concerns of LNG buyers and the implications of these concerns for sellers in developing a viable project business model. The table applies not just to second wave US export project developers but more generally to all investors in new liquefaction capacity. 1. Contract duration LNG market transitioning to shorter term contracting. Buyers unwilling to sign 15-20 year offtake contracts. Tough to find long term contracts to underpin financing. Constrains debt financing opportunities. Pushes risk onto equity. 2. Price level Buyers unwilling to sign contracts at price levels that cover supply LRMC. Demand of some emerging buyers price sensitive. Market price recovery has become a producer’s problem. 3. Price indexation Increasing preference for gas hub vs oil indexation. Producers losing option to link LNG contract pricing to oil. 4. Market risk 1. 2. & 3. combine to undermine buyer appetite for taking long term market risk (e.g. via US export tolling model). Market risk pushed onto upstream equity investors. Increases focus on supply chain presence to access market & monetise gas. 5. Flexibility terms Buyers want diversion flexibility & ability to resell cargo to support portfolio optimization. Access to LNG supply chain flexibility transitioning from seller to buyer. Charif Souki kickstarted the 1st wave of US export projects when he set up Cheniere. He left there in 2015 and has been doing his best to catalyse the 2nd wave via his new company Tellurian. The business model Tellurian are proposing involves an integrated presence across the supply chain from upstream equity gas, through liquefaction to shipping, marketing & trading. Tellurian is trying to convince buyers to not only sign up to LNG offtake, but also to provide 65-70% of project equity. This is only one example of a range of business model innovations currently being undertaken by prospective US project developers. Acheiveing this largely comes down to low cost of capital, ability to execute new terminals efficiently and having an established trading and supply chain presence. Assuming that extrinsic value from cargoes (e.g. from destination flex) accrues to the liquefaction project as opposed to the marketing and trading function required to monetise it. So what ingredients are likely to drive a viable next wave project business model? Chart 1 shows our view of how the cost structure of a 2nd wave US export project may compare to a 1st wave project. Again there is no magic. Numbers are falling based on investor expectations of declining costs of liquefaction and feedgas. One of the key changes likely to feature in 2nd wave business models is the internalisation of project costs and exposures. This is facilitated by an integrated supply chain presence from upstream equity gas through to active marketing & trading. This model stands in stark contrast to 1st wave US export project developers that used tolling contracts to outsource the costs and exposures associated with getting gas to and from the terminal. 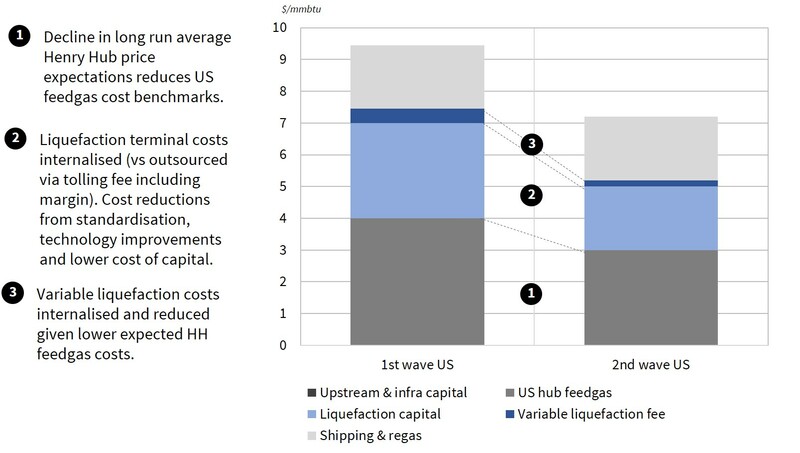 Cost & exposure internalisation means that 2nd wave FID decisions are likely to be based on equity investor’s expectations of market prices (US hub and LNG spot prices) and project costs, rather than depending on the external pricing of tolling contracts and non-recourse debt. The shifting behaviour of LNG buyers is pushing 2nd wave developers towards a more merchant oriented marketing model. Limited availability of long term offtake contracts means market exposures are likely to be managed via a combination of shorter term contracts (e.g. 3 to 5 years) and spot cargo optimisation. What does it take to finance liquefaction projects with retained market exposure like this? In short: big balance sheets and an ability to price and manage market risk. That points to oil and gas majors and large LNG portfolio players with an existing supply chain presence as the main sources of next wave project equity. These companies have lower equity hurdles and can raise incremental corporate debt faster and cheaper than independents relying on non-recourse financing from banks. Avoiding transaction costs, by moving gas through the supply chain instead of having to transact in the market e.g. bid/offer spread and credit risk costs. Accessing relatively low cost commercial capability to monetise cargo value, via existing LNG marketing and trading functions. That said it is important to recognise that incremental value generated via commercial optimisation of cargoes accrues to the marketing and trading business, not to the liquefaction project. There is one clear hurdle hindering the progress of 2nd wave US exports. The current ownership structure of projects does not reflect the backing of large gas and LNG players. Aside from Golden Pass (Qatar Petroleum, Exxon & Conoco), 2nd wave ownership is skewed towards specialist developers and smaller scale players. This suggests to us that a period of project consolidation, aggregation and change in equity ownership is approaching fast. This process should help sort out a more credible subset of viable projects, with a number of 2nd wave options unlikely ever to be commissioned. Changes in ownership do not mean that existing owners will be cut out entirely. But the balance sheets and supply chain presence of large players is required to propel 2nd wave projects past FID. How this is facilitated in practice is the next real challenge for US LNG.